Tool-view interpret currently selected data to several most used data types. Allows to preview content of a file. 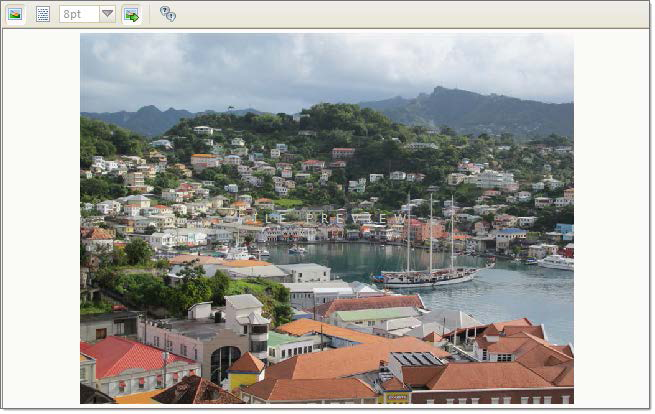 Supports basic image formats and registered document types, such as MS Office, PDF's etc. Provides advanced navigation through file structure. Provides ability to mark certain locations on edited subject to faster access and navigation. Enhanced search within edited content. 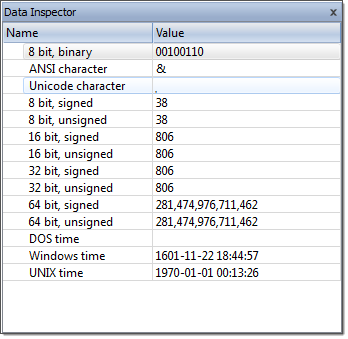 The Data Inspector is a small tool view window that provides the service of “inspecting” (or interpreting) data currently selected in the edit pane. The Data Inspector lets you view the type of data you have selected. This may help you interpret data as displayed in Disk Editor. Right-click anywhere in the Data Inspector window. The Data Inspector window is dockable and its location can be changed by clicking on the window title and dragging it to the new location. If the Data Inspector window is sharing its space with other tool views, you can change its relative position by left clicking and dragging the window tab. You can close the window by clicking on the [X] button in the top right corner of the window and reopen it again using the View menu in the Disk Editor Toolbar. File cluster chain is one of the essential approach to analyse file data integrity and file recovery/ To help navigate through the content of an open file, file's cluster chain, shown sequence number, offset and size of each chain, is displayed in File Cluster Chain view. Go to selected cluster of cluster chain. Same effect can by achieved by double-clicking on cluster entry in cluster chain list. Go to next cluster chain in sequence. In Active@ Disk Editor provides ability to preview files along with editing of its content and explore volume entry records. With this option on files, selected in context source, will be previewed automatically. 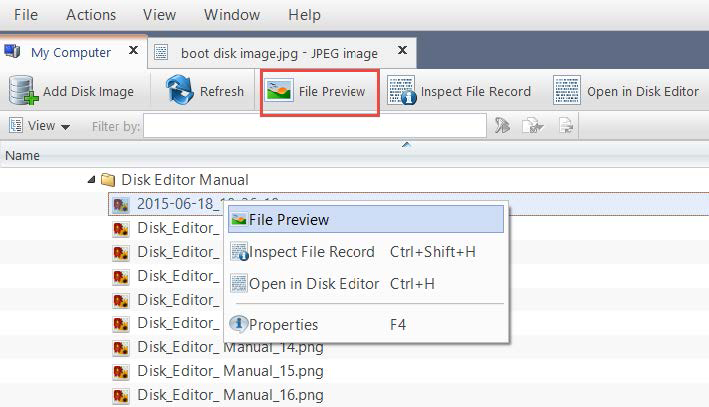 Toggle this option off if for any reason file preview causes delays in file navigation. In this mode, all registered previewers and supported graphics formats in current system will be shown. Note: If the preview file is not available then it appears in hexadecimal or text mode.